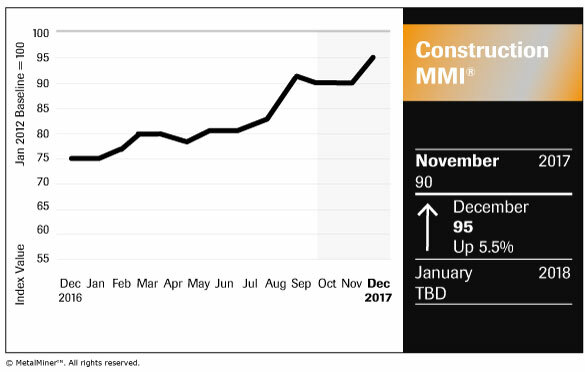 The Construction MMI, tracking metals and raw materials used within the construction industry, surged 5.5% to a value of 95 for December. 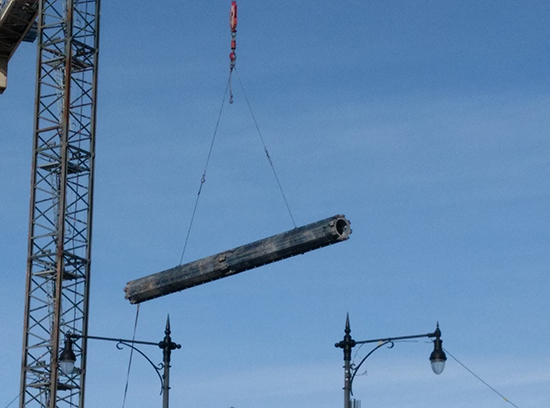 Every single price point comprising the Construction MMI — including ferrous, non-ferrous and scrap components from the U.S., Europe and China — rose as of Dec. 1, with the exception of U.S. steel bar fuel surcharges. The biggest mover appeared to be the Chinese rebar price, spiking 17.7% from November to December. We’ve breached new territory with this month’s reading. Not since May of 2012 has the Construction MMI performed this strongly. Here’s what we wrote back in May: “We’re in the salad days for the U.S. construction sector, at least as far as 2017 is concerned.” According to the Associated General Contractors’ analysis, construction spending was at record levels for the second straight month in March,” as quoted by forconstructionpros.com. Well, after a bit of a summer slowdown, it’s looking even better this month to round out 2017 as a pretty great year for the sector. The Commerce Department said last week “that construction spending increased 1.4 percent to a record high $1.24 trillion, the swiftest advance in five months,” according to Reuters, exceeding analysts’ expectations and driven by state, local and especially federal government spending. To boot, the AIA announced mid-last month that “the monthly Architecture Billings Index (ABI) came in at a score of 51.7 in October, up 2.6 points from September’s score of 49.1.” The ABI is a leading economic indicator of U.S. construction activity, and “reflects a nine- to 12-month lead time between architecture billings and construction spending nationally, and regionally, as well as by project type,” according to the article linked above. Interestingly, a longer-term ABI uptrend appears to be firmly in place — since 2012, the index looks to be achieving “higher highs” each time it peaks. “As we enter the fourth quarter, there is enough design activity occurring that construction conditions should remain healthy moving through 2018,” said AIA chief economist Kermit Baker, Hon. AIA, in a press release, according to Architect Magazine. MetalMiner analysts are generally bullish on both the industrial (especially base) metals complex and commodities overall, which can be seen directly in this month’s surges of our MMI sub-indexes such as Construction and Automotive.